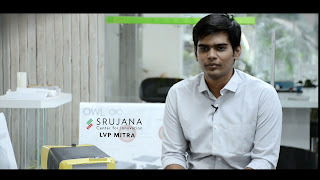 I worked at Srujana Centre for Innovation as an LVP-MITRA fellow for 6 months until January 2017. It was a turning point in my life. Before coming to Srujana, I was ambiguous of what to do in life. But at Srujana, looking at how my knowledge and expertise could impact the lives of people, I realized my true passion. Though an amateur, I wanted to fly, learn more, visit new places and meet new people. But I lacked confidence about not studying in a good university and lacking experience. I took a chance and applied for a fellowship at Harvard Medical School. Luckily, I got through. They loved my work and wanted me to participate in the ongoing research. I had a hard time convincing my parents as it would need a lot of money. But your advice and guidance helped me a lot. I am now working closely with professors and clinicians at MEEI for developing vision aids for low vision patients. I am having a wonderful time working here, learning new things and improving my knowledge. I want to thank you very much for your support and guidance. I feel very lucky to have met you in my life.